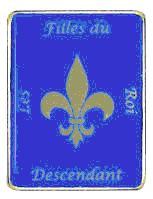 Are You a Filles du Roi Descendant? More than 350 years ago the King’s Daughters or Filles du Roi arrived in Quebec. They emigrated to New France between 1663 and 1673 as part of a program sponsored by Louis XIV. The program was designed to boost Canada’s population both by encouraging male emigrants to settle there, and by promoting marriage, family formation and the birth of children. While women and girls certainly emigrated to New France both before and after this period, they were not considered to be filles du roi, as the term refers to women and girls who were actively recruited by the government and whose travel to the colony was paid for by the King. The title “King’s Daughters” was meant to imply state patronage, not royal or even noble parentage. Most of these women were commoners of humble birth. Almost every person of French-Canadian descent can claim at least one of these incredible, young women in their heritage. AFGS invites you to recognize your King’s Daughters. Here is what to do. Send us a straight line chart starting with you and ending with your “fille du roi.” (A sample straight line chart and a list of the “Daughters of the King” are included in the mailing or downloads.) You must include the date and place of each marriage. We will send you a specially designed lapel pin identifying you as a descendant and a certificate with your name as well as the name of the woman from whom you descend and a folder to hold your certificate. 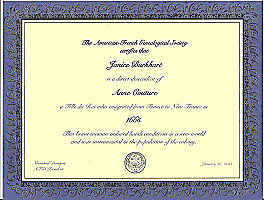 For members of AFGS, the cost is $15.00 for the first certificate you order. As many of us have more than one “fille du roi” in our line, you may order certificates for other “Daughters of the King” for $10.00 each. These additional certificates will not be accompanied by lapel pins unless $15.00 is paid. Non-members may participate but the cost will be $20.00 for the first certificate (with pin) and $15.00 for each additional certificate (without pin). We will check each straight line for accuracy.